PRESS: Egyptian Ambassador to Berlin Badr Abdel Atty and Egyptian expatriates after casting their ballots at the Egyptian Embassy in Berlin on 19 April 2019. CAIRO – 19 April 2019: The Egyptian Embassy in Berlin on Friday witnessed a high turnout of voters who flocked to the embassy to cast their ballots on the new amendments to the Egyptian Constitution. Egyptian expatriates started a three-day voting on the new constitutional amendments in 140 embassies and consulates of 125 countries worldwide, amid massive campaigning for the amendments abroad and domestically. Egypt’s Ministry of Migration dedicated hotlines for Egyptian expatriates to receive any complaints or questions related to the three-day public referendum. Egyptian expatriates could contact the Ministry of Migration on the following phone numbers: +201289850655/ +201017071810 / +201159476593. 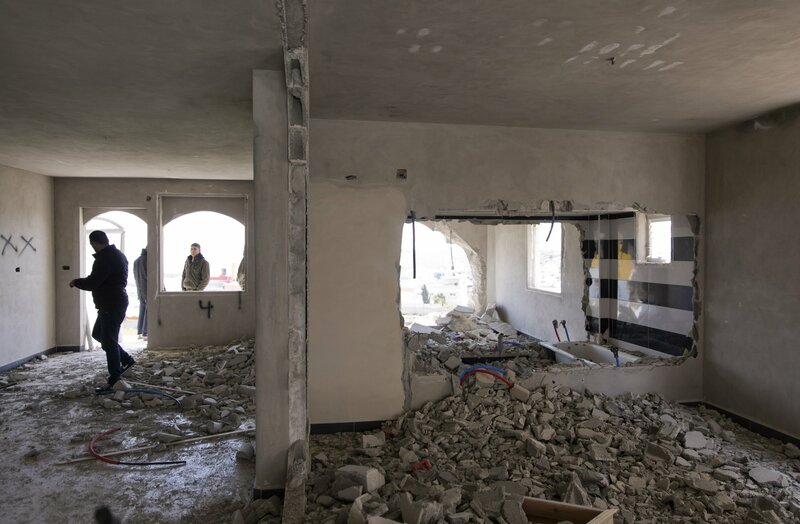 HEBRON, West Bank (AP) — The Israeli military has demolished the family home of a Palestinian charged with the killing of a 19-year-old Israeli woman. Israeli forces bulldozed two apartments belonging to the father of Arafat Erfayieh in the West Bank city of Hebron on Friday. Erfaiyeh was arrested and charged in February with the killing of Ori Ansbacher, whose slain body was found in a West Bank forest near Jerusalem. Israel often demolishes homes of alleged Palestinian assailants or their families, saying it deters future attacks. The Israeli military has demolished the family home of Erfayieh, a Palestinian charged with the killing of a 19-year-old Israeli woman. Egyptian expatriates line up in a queue outside the Egyptian embassy in Riyadh to vote in the public referendum on the new constitutional amendments on Friday- press photoEgyptian expats celebrate after casting their votes in the public referendum on the constitutional amendments- press photoEgyptian expats head from New Jersey to New York to vote in the constitutional amendments- press photoEgyptian ambassador to Canada ballots his vote- Press PhotoEgyptian expats, who are working at the petroleum sector in Jordan, pose for a picture after casting their ballotsEgyptian expats and Egyptian ambassador to Germany Badr Abdel-Atti pose for a picture after casting their votes on the constitutional amendments - press photoAn Egyptian woman casts her vote in the Egyptian embassy in New Delhi - press photoEgyptian expats head to the Egyptian embassy in Dubai to vote on the constitutional amendments - press photoEgyptian family at the Egyptian embassy in Beirut to vote on the new constitutional amendments- press photoAn expatriate casts his vote on the new constitutional amendments at the Egyptian embassy in Beirut- press photoEgyptian expats participate in a three-day voting on the new constitutional amendments in Riyadh-based embassy - press photoEgyptian ambassador to Iraq Alaa Morsi casts his vote on the constitutional amendments- press photoAn expat casts his vote on the constitutional amendments- press potoEgyptian expats vote on the constitutional amendments in Asturias - press photoCAIRO – 19 April 2019: Egyptian expatriates started a three-day voting on the new constitutional amendments in 140 embassies and consulates of 125 countries worldwide, amid massive campaigning for the amendments abroad and domestically.The amendments include a “transitional article” that allows President Sisi to remain in power until 2024; Sisi will also have the right to run for a new 6-year term. The amendments also give the president the right to choose heads of courts, judicial bodies, the Supreme Constitutional Court, and the Attorney General, Egypt's top prosecutor from some nominees.Immediately after the Egyptian House of Representatives approved the new amendments to the 2014 Constitution on Tuesday, head of the National Election Authority (NEA) Lachine Ibrahim, called on the Egyptian expatriates to vote in the planned referendum on constitutional amendments from Friday, April 19, to Sunday, April 21. They also can contact the ministry via mail: Info.elections@emigration.gov.eg , the minister said in a statement on Thursday.Egyptian expats continue flocking to the Egyptian embassy in London to vote on the new amendments.Egyptian embassy in Washington and Ottawa and consulate in New York opened their doors for the Egyptian expats to ballot their votes on the amendments.Egyptian expats in Jordan after cast their votes in the public referendum on the constitutional amendments. Some voters sent Egypt Today their photos inside the embassy to share their moment of voting.Expatriates of the Egyptian community in Bahrain headed to Manama-based embassy toExpatriates outside the Egyptian embassy in Kuwait lined up in a long queue, waiting to cast their votes on the constitutional amendments.The Egyptian embassy in Beirut received Egyptian expatriates to vote in the public referendum. Also the member of diplomatic staff cast their ballot.In Saudi Arabia, where hosts the largest Egyptian community in the Arab world, Egyptian expatriates cast their votes in Riyadh-based embassy amid high turnout.Egyptian expatriates in Iraq headed to vote. Hundreds of Egyptian citizens took part in an election rally in Cairo's Abdeen square – Egypt Today/Hossam AtefHundreds of Egyptian citizens took part in an election rally in Cairo's Abdeen square – Egypt Today/Hossam AtefHundreds of Egyptian citizens took part in an election rally in Cairo's Abdeen square – Egypt Today/Hossam AtefHundreds of Egyptian citizens took part in an election rally in Cairo's Abdeen square – Egypt Today/Hossam AtefHundreds of Egyptian citizens took part in an election rally in Cairo's Abdeen square – Egypt Today/Hossam AtefHundreds of Egyptian citizens took part in an election rally in Cairo's Abdeen square – Egypt Today/Hossam AtefHundreds of Egyptian citizens took part in an election rally in Cairo's Abdeen square – Egypt Today/Hossam AtefCAIRO – 19 April 2019: Hundreds of Egyptian citizens took to streets Cairo's Abdeen square to urge other citizens to cast their ballot in a three-day public referendum due to start on Saturday.The rally participants were putting on white tops, with words encouraging other citizens to cast their ballot printed on them, including "participate," and "Long Live Egypt," which the incumbent president always says in his speeches.On Saturday, the registered voters inside Egypt will be able cast their ballot over three consecutive days, in a referendum on a set of constitutional amendments, including granting the president some unprecedented rights.The rally is organized by the Cairo Governorate authority, in cooperation with the Sport and Youth Directorate, and under the auspices of Cairo governor Khaled Abdel Aal, who is set to personally take part in the rally, along with a number of public figures.The participators are set to walk across the governorate, and will be present in some places including al-Tahrir Square, which witnessed the January 25 revolution in 2011, ousting former President Hosni Mubarak, and June 30 revolution in 2013, which ousted former President Mohamed Morsi.The security forces always station in Al-Tahrir square to prevent further unlicensed protests and illegal gathering.A Tanoura show was seen during the rally, while participators have raised Egyptian flags and released many balloons.The approved amendments expand each of the two presidential terms allowed for any president to six years instead of four, while a separate transitional article gives an exceptional right to incumbent President Abdel Fatah al-Sisi, who was re-elected in 2018, to run for a third 6-year term after he finishes his second term in 2024 instead of 2022.The amendments also give the president the right to choose heads of courts, judicial bodies, the Supreme Constitutional Court, and the Attorney General, Egypt's top prosecutor from some nominees. He would also appoint one third of the members of the Shura Council, which was revived, this time under the name "The Senate." Ramses II constructed the path to the temple. Luxor temple is located north karnak temple! "How did ancient Egyptians build such gigantic buildings? Because they used ramps!! What is the evidence? JERUSALEM (AP) — Israeli police say they detained four suspects involved in an attempt to smuggle two baby goats into Jerusalem’s most sensitive holy site for a ritual sacrifice. Police said on Thursday that two Jewish minors intended “to cause provocations” by sacrificing the goats ahead of Passover. 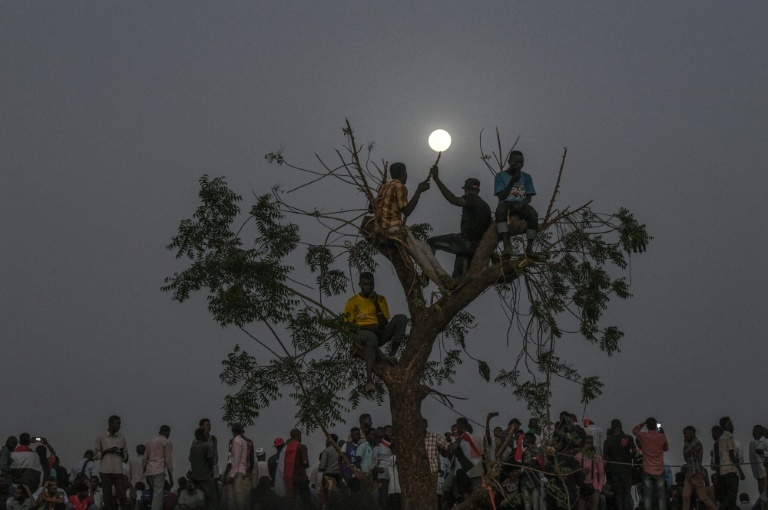 Police say such incidents occur every year as zealots challenge longstanding restrictions by attempting to perform sacrifices in the spot where biblical Temples once stood. In ancient times, animals were sacrificed at the Temple on Passover. 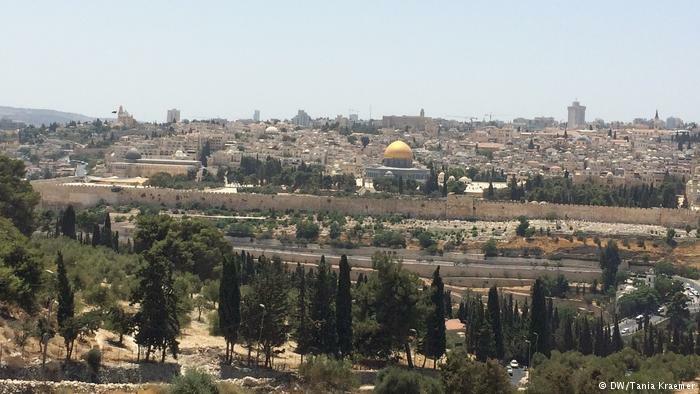 The landmark, known to Jews as the Temple Mount and to Muslims as the Noble Sanctuary, is considered the holiest site in Judaism and third-holiest in Islam. BAMAKO (Reuters) – Mali’s prime minister and his whole government resigned on Thursday, four weeks after a massacre of some 160 Fulani herders by an ethnic vigilante group shocked the nation. “The President accepts the resignation of the prime minister and that of the members of government,” a statement from President Ibrahim Boubacar Keita’s office said. It gave no reason for the departure of Prime Minister Soumeylou Boubeye Maiga, but legislators had discussed on Wednesday a possible motion of no confidence in the government because of the massacre and failure to disarm militias or beat back Islamist militants. The March 23 killings by suspected hunters from the Dogon community on Ogossagou, a village in central Mali populated by rival Fulani herders, were bloody even by the recent standards of Mali’s ever-worsening violence. Malian authorities have detained five people suspected of taking part in the massacre. The United Constitutional Patriots, who claim to be mainly military veterans, have been patrolling the U.S.-Mexico border near Sunland Park, New Mexico, since late February in search of illegal border crossers. They post near daily videos showing members dressed in camouflage and armed with semi-automatic rifles holding groups of migrants, many of them Central American families seeking asylum, until U.S. Border Patrol agents arrive to arrest them. 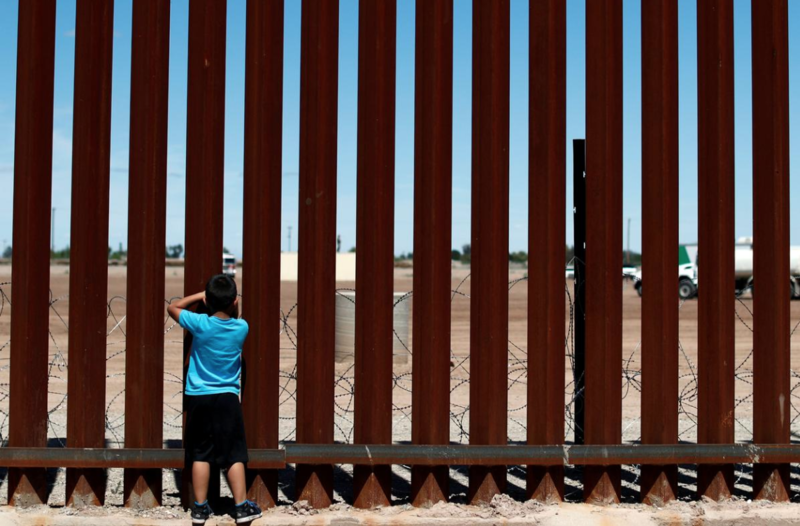 The small volunteer group says it is helping Border Patrol deal with a surge in undocumented migrants but civil rights organizations like the ACLU say it is a “fascist militia organization” operating outside the law. On a March 27 visit to El Paso, Texas, next to Sunland Park, then U.S. Customs and Border Protection (CBP) Commissioner Kevin McAleenan said his agency, which runs U.S. Border Patrol, did not need the help of citizens to police the border. U.S. armed groups have long patrolled the U.S. border, their numbers rising during upticks in migrant apprehensions, such as during the mid 2000s when the Minuteman Project was established. 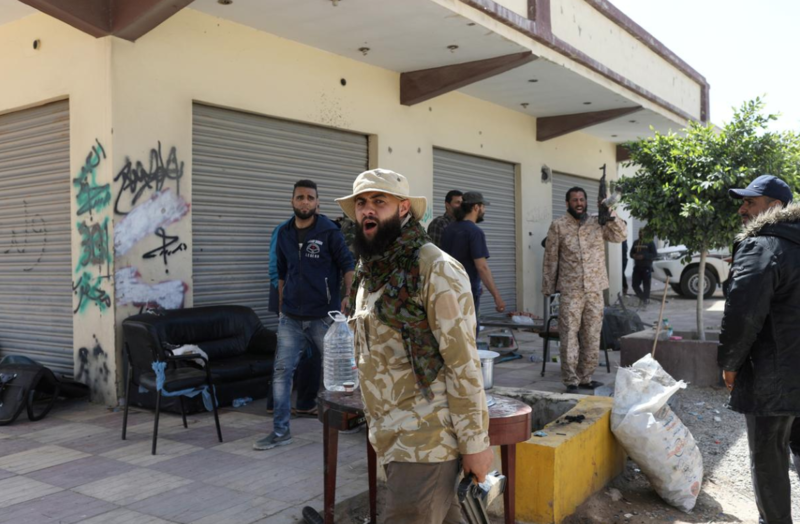 The Libyan National Army (LNA) of Benghazi-based Haftar has become bogged down in the southern suburbs of the capital. In al-Suani, a southwestern suburb, Reuters reporters saw two mortar bombs almost hitting a clinic. 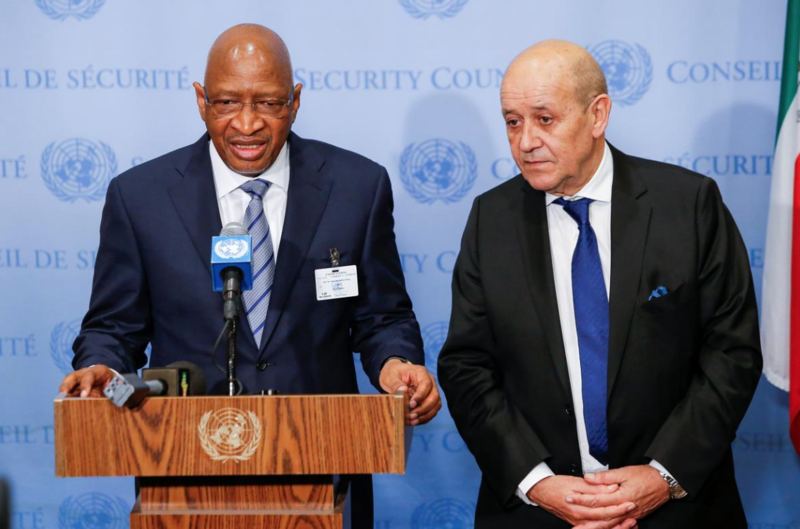 The internationally recognized interior ministry accused France of supporting Haftar and said it would halt security cooperation with Paris. “Any dealings with the French side in bilateral security agreements” will halt, the Tripoli-based interior ministry said in a statement. France has helped train Serraj’s presidential guard and in October 2013 signed a deal between a consultancy of the French interior ministry and the Libyan interior ministry to train 1,000 police. Hadad is said to be also a close friend of Kafoury, they were joined by a group of Kafoury's team. Yet a video that Kafoury posted on instagram caused controversy and set the rumour mill going as the footage showed him walking through the streets of London with a blond female. Some media outlets claimed this was his wife while others pointed out that he has in fact separated from his wife, so could this woman be the new lady in Kafoury's life or is she merely a friend or his assistant? Either way it seems from his instagram post that Kafoury thoroughly enjoyed his trip to London as he posted a video of him walking through the classy park of Holland Park near Kensington High Street and admiring a group of pigeons. And in another photo he is seen having brunch at a famous Lebanese restaurant.The huge success of Kafoury trip to London and his concert indicates that a repeat of such event is guaranteed with the organisers already promising on their social media pages to bring Kafoury back to the UK capital. Global automakers are positioning for a brave new world of on-demand transport that will require a car of the future — hyper-connected, autonomous, and shared — and China may become the concept’s laboratory. 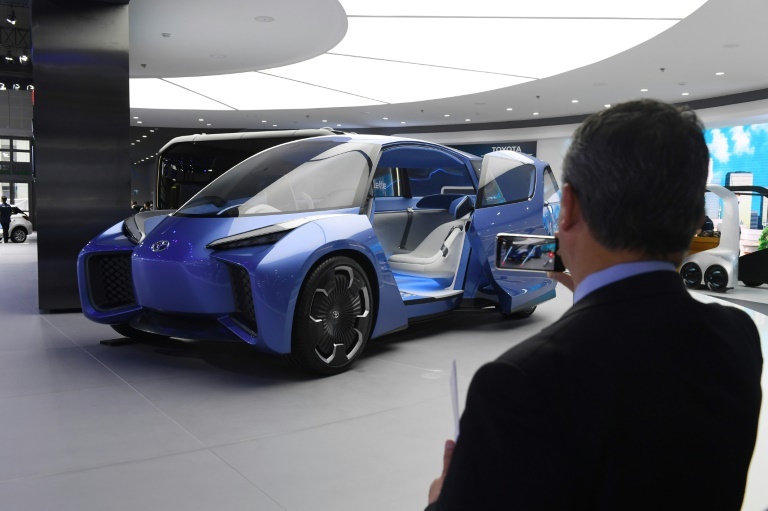 They will have to be smart, interconnected and of course shared,” Zhao Guoqing, vice president of Chinese auto giant Great Wall Motors, said on the auto show’s sidelines. Discussion of China and ride-hailing inevitably involves Didi Chuxing, the country’s omnipresent answer to Uber. And in February, Chinese technology giants Alibaba and Tencent joined hands with several manufacturers to develop a future platform for on-demand transport. Francois Marion, president of Valeo China, said the global advent of driverless cars is just around the bend. Ambassador Hisham Badr - Photo compiled by Egypt Today-Mohamed ZainROME, April 18 (MENA) - Egyptian Ambassador to Italy Hisham Badr said Thursday that the Egyptian Embassy has made all necessary preparations to start receiving Egyptian expats willing to vote on the constitutional amendments, set to start on Friday and run for three days.In statements, Ambassador Badr said the Egyptian Embassy has notified the Italian authorities to intensify their security measures around the embassy premises during the three days of the voting, urging Egyptian expats in Italy to take part in the voting process.He said the Egyptian Embassy has provided all facilities and communication means to enable the largest number of Egyptians to participate in the voting on Egypt's constitutional amendments.The diplomat urged members of the Egyptian community to exercise their national duty as it is one of the political gains the Egyptians abroad have obtained after January 25 and June 30 revolutions. FILE PHOTO - An Air Canada Boeing 737 MAX 8 from San Francisco approaches for landing at Toronto Pearson International Airport over a parked Air Canada Boeing 737 MAX 8 aircraft in Toronto, Ontario, Canada, March 13, 2019. REUTERS/Chris Helgren(Reuters) - Air Canada said on Thursday its Boeing Co 737 MAX pilots were reviewing aircraft systems and alternative flight conditions for the grounded planes, and the carrier would decide on further training pending final recommendations from regulators.On Wednesday, Canadian Transport Minister Marc Garneau called for pilots to receive simulator training for Boeing’s new 737 MAX software, going beyond a draft report by a U.S. Federal Aviation Administration-appointed board, which recommended additional training without requiring a simulator.Boeing is working to deliver to global regulators a software update and new training proposals for the MAX following a Lion Air crash in Indonesia in October and an Ethiopian crash in March, which killed 346 people combined.Boeing said on Wednesday it was making “steady progress” on the path to certifying the software update and had made the final test flight before a certification flight.Air Canada said it was the only carrier in the United States and Canada with 737 MAX simulators. The country’s largest carrier said it was pleased to see the Canadian government take a “rigorous approach” in how it weighs its requirements for reintroducing the jets into service.Air Canada’s rival, Westjet Airlines, declined to specifically address Garneau’s comments, but the carrier follows all Transport Canada recommendations, a company spokeswoman said by email. 2018 presidential election - photo combined by Egypt Today/Mohamed EzatCAIRO – 18 April 2019: Four rumors have been circulating about the draft constitutional amendments that were passed by the parliament on Tuesday and the referendum that will be held in less than 48 hours.There were claims that the amendments would reduce the powers of the House of Representatives. That is false as the draft does not include any articles on the powers of the House of Representatives.There were rumors that the ballot papers were printed before the social dialogue held by the House of Representatives had been finished. In reality, military institutions and the presidency have never proposed the amendments or intervened in the process. It is prohibited that any individual, agency, entity or group forms any military or paramilitary formations, troops or groups. "The amendments are introducing a quota for women to occupy 25 percent of the House of Representatives' seats.